Denied justice weaves a web of revenge and death in this new cozy mystery. A beautiful winter morning gives no hint of the danger that will engulf Martha Williamson, owner of The Spider's Web - a shop specializing in spinning and weaving. Living with her two Great Pyrenees dogs, Falcor and Denali, on a small farm near Black Hills, Washington, Martha has come to cherish the quiet life she created after the violent death of her husband in a car accident. However, the news spreads fast when Martha discovers a burglary of the town's beauty salon; and her friends fear another robbery. Gossip becomes reality; burglary becomes murder; and Martha's business card is found at the scene. When Falcor discovers the murder weapon and Martha is threatened, she is driven to find the killer. 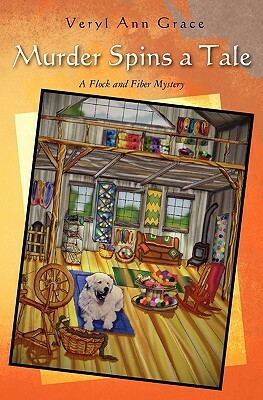 Taking the reader into her world of fiber arts, Martha, with Denali and Falcor at her side, spins her way through a tangle of clues, deception and danger. Although Veryl Ann Grace learned to knit and crochet at her grandmother's knee, her real passion for fiber arts began when she realized she could create yarn from all the hair her beloved Great Pyrenees shed. That was twenty-five years ago and she can still be found spinning, knitting and weaving fiber of all kinds including livestock guardian dog hair. A long time resident of Washington state, she currently lives in Hawaii with her husband, a Maremma, and two poi dogs.